The yoke and sleeves of this tunic are completed. Small sequins and beads are stitched to the centre of the yoke to give the effect of buttons. Choosing a green colour for the yoke and sleeves would have a been a better choice.But I wanted to try this in brown colour to learn the effect. 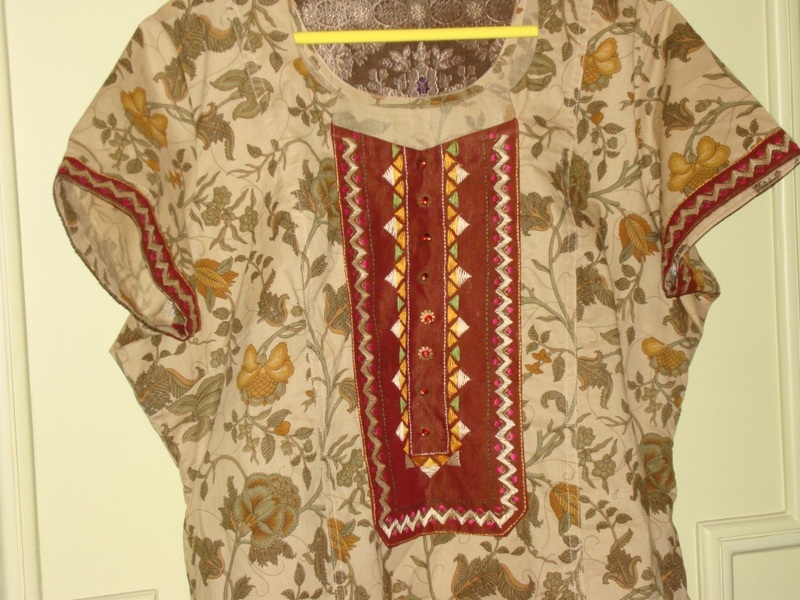 This yoke pattern leaves some empty space , a crowded pattern could have enhanced the look of the tunic. These are just other options to work with. 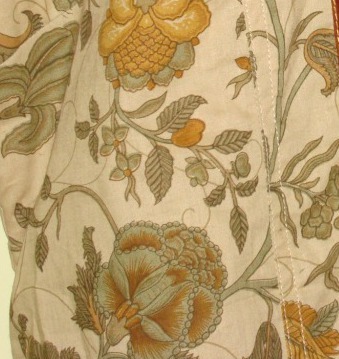 The beige thread was first worked for the central pattern on the yoke. Then the same was used for the zigzag pattern on the outline and sleeves. The outlines were done in back stitch in green and yellow. 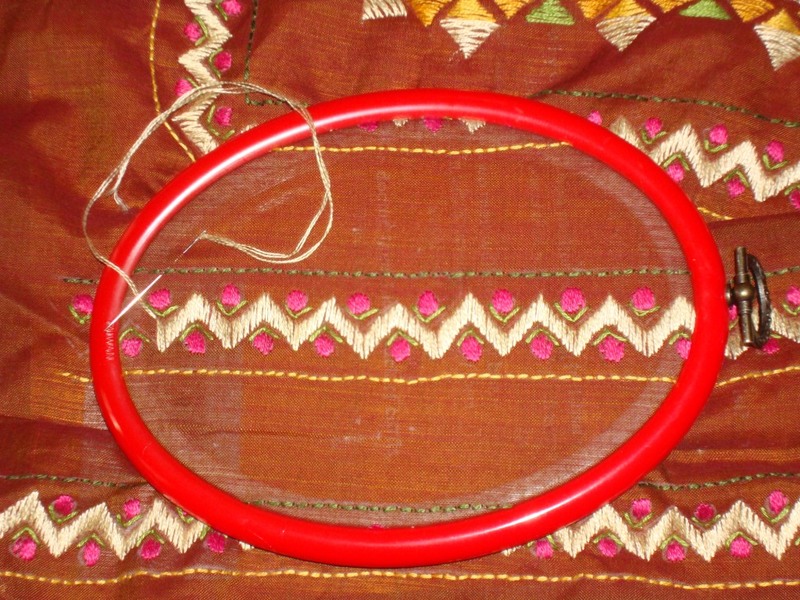 The round patterns were done in satin stitch[ fearing the surface satin might alter the small rounds into ablong shapes] in majenta thread. small fly stitches were done in the valley in light green thread. 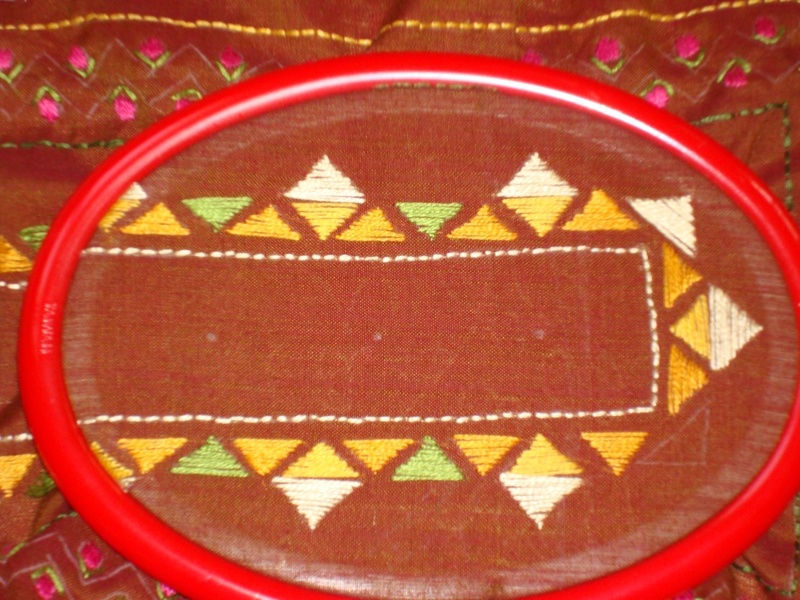 Now the zigzag pattern was worked in phulkari- surface satin stitch. The next post on the completed yoke and tunic. I have done the left over triangles in light green and beige. 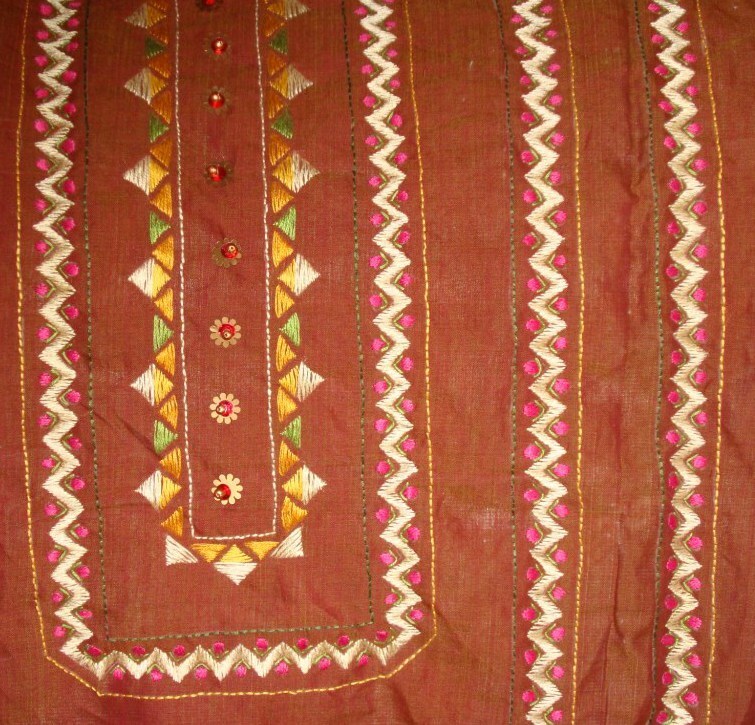 The phulkari looks like satin stitch, but it is only surface satin. Geometrical shapes are worked in surface satin stitches. The patterns are spread over a large area, for- bedspreads, cushions, dupattas, tunics, to name a few. I saw a film’Rab ne banaya jodi’ where the heroine wore fully embroidered phulkari dupattas most of the time, especially during song sequences. The beige colour worked on the zigzag border design , on my next post. This beige fabric is printed with traditional Indian pattern.I loved the colour , print and the combination. 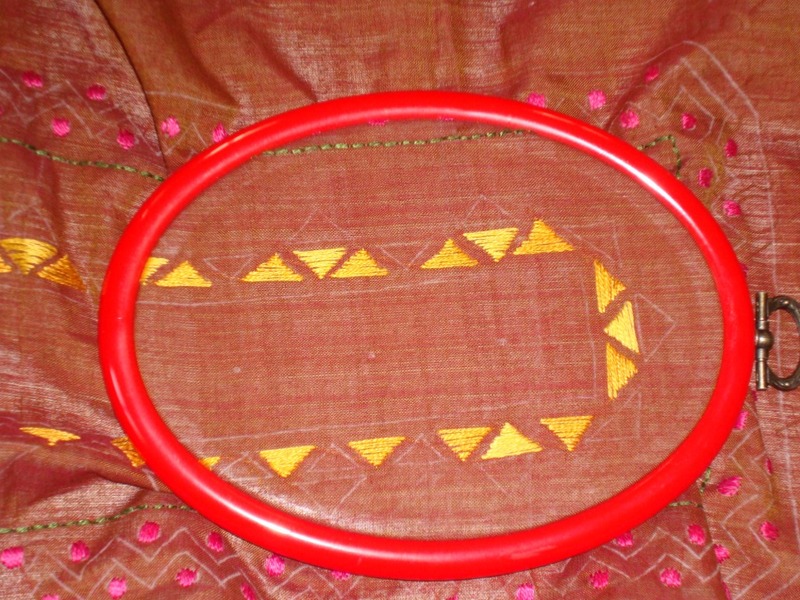 Pattern- This was a simple phulkari border used for yoke and sleeves. Colours- Though beige and green with traces of golden yellow would have been perfect, I found the green did not show well in the brown fabric, I kept the beige, yellow and added majenta to enhance the effect. I started with some green outlines, worked the circles in majenta, then the some triangles in yellow[ the yellow from the tunic fabric did not go well on this brown too]. The progress on the next post.